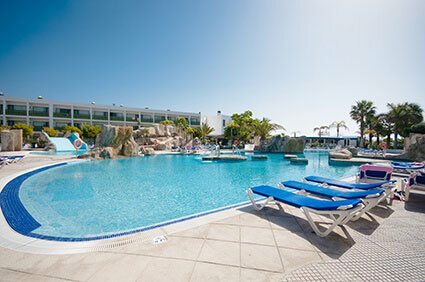 Holiday like royalty in this popular and relaxed resort on Lanzarote’s beautiful east coast. Costa Teguise has a great deal to offer families and couples alike. Its friendly, laid back vibe will have you under its spell the moment you arrive, with five sun-drenched beaches, a wide pedestrian promenade lined with homely bars and fine restaurants, and an easy-going nightlife. For the more adventurous, Costa Teguise is the prime location for the island’s windsurfing fanatics, while your younger family members will have the time of their lives on the thrilling water slides of Aquapark. Family-orientated with a vibrant buzz, Costa Teguise welcomes you to do as much or as little as you like. Its Blue Flag beaches are a big hit with sun worshippers, and the cooling breeze is a welcome addition in the scorching summer months, as well as drawing professional and not-so professional windsurfers to the resort in droves. The surreal volcanic landscape of Timanfaya National Park, a few miles inland, makes for some stunning hiking routes, while the white knuckle rides in the island’s biggest water park will satisfy an appetite for excitement. The nightlife here is wide-ranging and eclectic, with a host of great seafood restaurants and chic Canarian bars alongside authentic British pubs and clubs. For a taste of the true hedonist lifestyle, the party capital of Puerto del Carmen is within easy reach. If the mood strikes, Costa Teguise makes a great base from which to discover the rest of this fascinating island, while the Costa Teguise hotels are a comfy base to relax in. The cosmopolitan metropolis of Arrecife is just next-door, with its wealth of cultural heritage and fabulous shopping opportunities to explore. Further afield, you can sample a taste of true Canary Island living in the traditional fishing village of Arrieta, tucked away quietly in the tranquil surroundings of the northeast coast. Costa Teguise sits just 15-kilometres from Lanzarote’s international airport at Arrecife, on the island’s east coast. 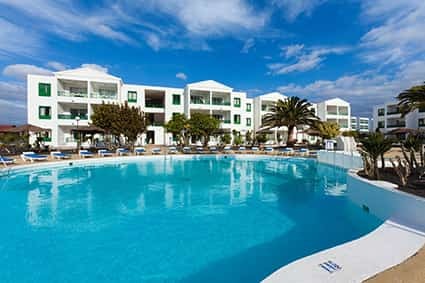 There are shuttle buses that run to the resort every few minutes as well as plenty of reasonably priced taxis, and friendly Costa Teguise hotels all along the coast. Costa Teguise’s main beach is the most popular with families due to its gentle slope into a warm, shallow sea. The mile-long stretch of golden sands are also a major draw for the island’s windsurfers and the waters off the coast here are usually partitioned to separate them from swimmers and paddlers. There are facilities aplenty too, with loungers and sunshades available to hire and you’re just a short walk from a host of shops and bars, so even grabbing lunch is easy. Set inside a small horseshoe bay of volcanic rock, Playa Jablillo is afforded more shelter from the keen winds in this part of the island, making it the ideal beach for swimming. Well stocked with sunbeds and showers, its calm shallow waters are safe for children of all ages and there’s a lifeguard on duty all year round. Probably the prettiest beach in Costa Teguise, Playa Bastian is surrounded by exotic palm trees that give it a real tropical feel. The least crowded of all the resort’s beaches, it’s easy to find your own secluded spot here on the fine black sand, and there are excellent facilities close to hand. There are even BBQ grills to cook your food and large stone zocos to shelter from the wind. The waters off the Costa Teguise coast play host to one of the freestyle stages of the PWA (Professional Windsurfing Association) World Tour, with more than 100 of the sport’s elite athletes descending on the resort every summer to show off their moves. Grab the best seat in the house at Cucharas Beach to see some amazing skills. A wild fiesta of music, dancing, costumes and street parades, Carnival time in Lanzarote is a treat for the senses and not to be missed. Celebrated in most towns and villages across the island, Costa Teguise pulls out all the stops to ensure its visitors have a fabulous time. Starting at the end of February and going on for several weeks, it’s the essential Canarian experience. Lanzarote’s spectacular scenery coupled with its refreshing year-round sea breeze make it one of Europe’s most intriguing destinations for golfers. The 18-hole course at Costa Teguise lies at the base of a dormant volcano and was designed by renowned British landscape architect John Harris. Voted the best course in the Canary Islands by none other than the late great Seve Ballesteros, players are required to negotiate lava rocks, wicked doglegs, cunningly placed sand traps and more than 3,000 mature palm trees. Stunning views over the Atlantic and a first-rate clubhouse are your reward. The otherworldly lunar landscape of Timanfaya National Park is Lanzarote’s most popular tourist attraction, and it’s not hard to see why. The 100 volcanoes that created this bizarre vista last erupted in 1736, but gives visitors an idea of what the Earth must have looked like when it was first formed. The intense geothermic vapours just below the earth’s crust are still around 450-500 degrees Celsius and are used by the aptly named El Diablo restaurant to cook the food it serves its diners. You can try one of their delicious ‘volcano-BBQ’ dishes for yourself while gazing at the awe-inspiring views. An exhilarating adventure playground of water slides and splash pools, Aquapark promises an amazing experience no matter your age or how brave you’re feeling. More daring members of the family will love the twists, turns and stomach dropping free-fall excitement of rides like the Kamikaze and the Spiral, and there are plenty of mini slides and paddling pools for the youngest ones.